It’s almost time for a new edition of ‘Rosé All Day’. The first edition took place in the Magical Wilhelmina Park last year and has proved to be an innovative event, where wine lovers came together for a relaxing afternoon, good music, and exquisite bites accompanied by delicious rosé. This year the Renaissance Aruba is raising the bar -and their wine glasses- for the second annual edition of Rosé All Day, which will take place on Iguana Beach, at the Renaissance Island. According to representatives of Renaissance Aruba Resort & Casino, the concept ‘Rosé All Day’ proved itself last year. This year, the experience has been amplified to ‘wow’ all present from the moment they step into the water taxi heading to Renaissance Island. Something new, yet innovative by Renaissance Aruba is to set a floating stage in the water and when the sun sets, the party starts! Enjoy performances by a live band, electrifying DJ’s, Food Stations and Style Bars serving pink bubbles. Upon arrival, all visitors will receive a backpack including their own Rosé cup, a cooler bag, a blanket and $10 Rosé wine credit to spend. There will be several food stations from different Renaissance Aruba Resort & Casino restaurants- on location serving the perfect bites to pair with your favorite Rosé. For instance, visitors can enjoy dishes from Fresco, Aquarius, L.G. Smith’s Steak & Chop House and Papagayo. There is also a bar from the Arion Wine Company which is expected to be the center of attention where visitors can order wines such as Whispering Angel, Champagne Bollinger, Ti Amo and The Palm Rosé. 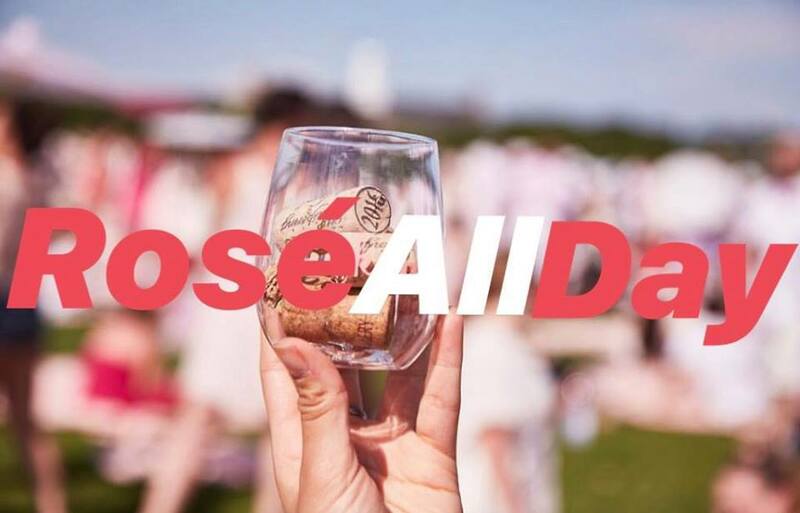 The organization has really thought of all the details to make this second annual edition of ‘Rosé All Day’ as memorable as possible. 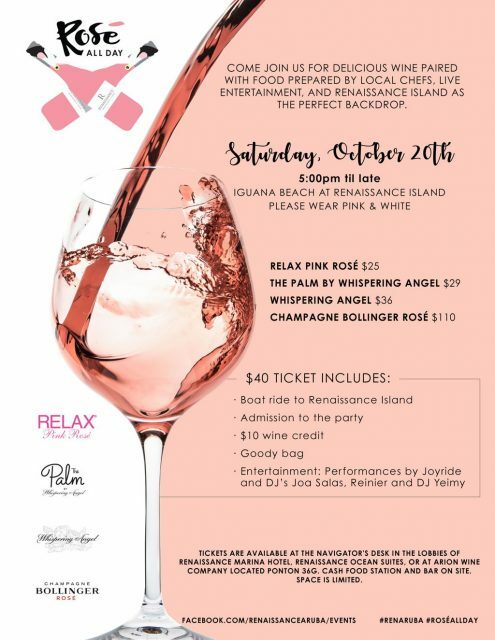 Get ready to Eat, Slay and Rosé October on 20th at Renaissance Island. Tickets are already on sale at the Navigator desks in the lobby of the Renaissance Marina Hotel and at Renaissance Ocean Suites as well as at Arion Wine Company for $40. Tickets are limited. For more information about the ‘Rose All Day’, please call 5236115 or visit the Facebook page of Renaissance Aruba Resort & Casino. Dress code for this event is white or pink. 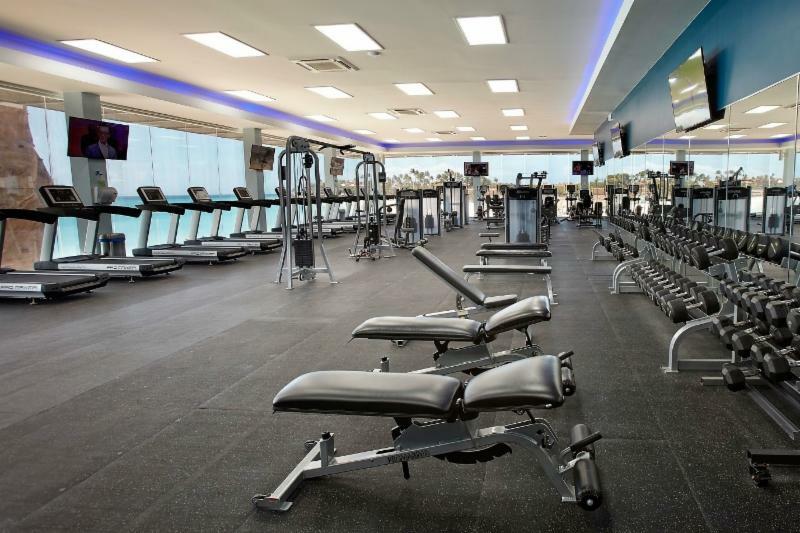 Discover more on Renaissance Aruba Resort & Casino.